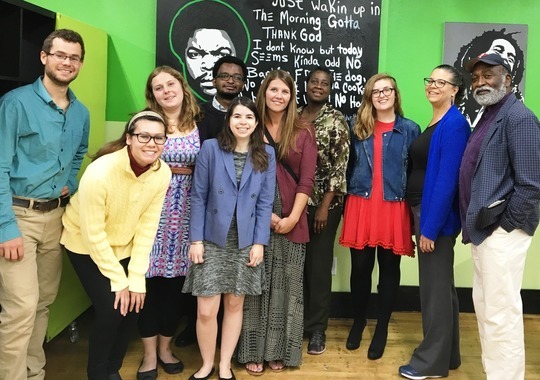 Summer vacation has come to an end, and a new cohort of five AmeriCorps VISTAs began their year of service. Members from other Promise Zones visited North Minneapolis to share lessons learned, words of encouragement and advice from their peers around the country. Discussions with the staff from the Camden, NJ and IndyEast (Indianapolis), IN Promise Zones highlighted some of the shared challenges and opportunities faced by Promise Zones. In Camden, collaboration with local partners to implement a mobile farmer's market increased visibility and cultivated a relationship of trust between the Promise Zone and community members. IndyEast shared tips for engaging partners around large events such as the Super Bowl.The MPZ hopes to apply these types of lessons learned from other Promise Zones for the upcoming service year. West Broadway's Open Streets showcased how much North Minneapolis has going on. Between the great food, art, dance, and social events there is no shortage of creativity in North Minneapolis. 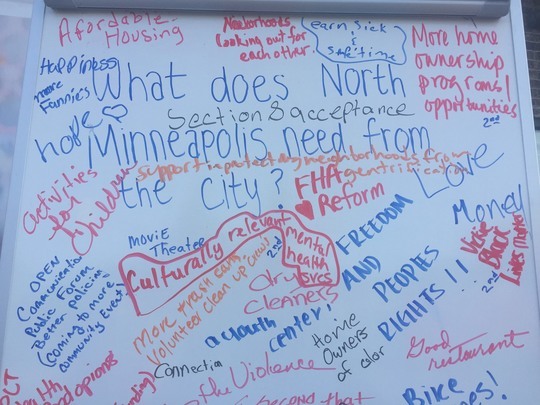 A Promise Zone exhibit asked Open Streets attendees what they need from the City. Ideas ranged from more home ownership programs to culturally relevant mental health services. Just down the street the Minneapolis Police and Fire Departments hosted their fifth annual Battle of the Badges. Food was served to over 3,100 community members, and the Minneapolis Police Department reclaimed their trophy for the best ribs. September 23- 10 a.m.- 2 p.m.
October 7- 11 a.m.- 5 p.m.
November 18- 11 a.m.-5 p.m. The purpose of the Jobs Plus Pilot program is to develop locally-based, job-driven approaches to increase earnings and advance employment outcomes through work readiness, employer linkages, job placement, educational advancement, technology skills, and financial literacy for residents of public housing. The place-based Jobs Plus Pilot program addresses poverty among public housing residents by incentivizing and enabling employment through earned income disregards for working families, and a set of services designed to support work including employer linkages, job placement and counseling, educational advancement, and financial counseling. Ideally, these incentives will saturate the target developments, building a culture of work and making working families the norm. The Jobs Plus Pilot program consists of the following three core components: Employment-Related Services Financial Incentives; Jobs Plus Earned Income Disregard (JPEID) Community Supports for Work Applicants are encouraged to develop key partnerships to connect participants with any other needed services to remove barriers to work. An Individualized Training and Services Plan (ITSP) should be developed for each participant to establish goals and service strategies, and to track progress. In FY 2018, NIFA's CFP intends to solicit applications and fund two types of grants. The types are entitled (1) Community Food Projects (CFP) and (2) Planning Projects (PP). The primary goals of the CFP are to: Meet the food needs of low-income individuals through food distribution, community outreach to assist in participation in Federally assisted nutrition programs, or improving access to food as part of a comprehensive service; Increase the self-reliance of communities in providing for the food needs of the communities; Promote comprehensive responses to local food access, farm, and nutrition issues; and Meet specific state, local or neighborhood food and agricultural needs including needs relating to: Equipment necessary for the efficient operation of a project; Planning for long-term solutions; or The creation of innovative marketing activities that mutually benefit agricultural producers and low-income consumers. Choice Neighborhoods Implementation Grants support the implementation of comprehensive neighborhood revitalization plans that are expected to achieve the following three core goals: 1. Housing: Replace distressed public and assisted housing with high-quality mixed-income housing that is well-managed and responsive to the needs of the surrounding neighborhood; 2. People: Improve intergenerational mobility with a focus on children and families; employment, health, and education outcomes; and 3. Neighborhood: Create the conditions necessary for public and private reinvestment in distressed neighborhoods to offer the kinds of amenities and assets, including safety, good schools, and commercial activity, that are important to families; choices about their community. HUD expects to make at least 2 awards from the funds available under this NOFA: Project 1 - Understanding Child Trajectories in HUD-Assisted Housing (HUD may award one or more cooperative agreements for this project). Project 2 - The Social and Economic Impacts of the Community Development Block Grant Program (HUD may award one or more cooperative agreements for this project). The following is a general description of the Education and Outreach Initiative (see chart in section III. A. for all eligibility requirements and a listing of related components): Education and Outreach Initiative (EOI). This Initiative provides funding to organizations that inform the general public about their rights and obligations under the Fair Housing Act. EOI applicants may be funded under the following components based on eligibility:1. Education and Outreach Initiative (EOI) - $7,450,000 a. National-Based Programs - National Media Campaign Component (EOI-NMCC) - $1,000,000 b. Regional/Local/Community Based Program - General Component (EOI-G) - $6,450,000 Under the EOI NOFA, applicants may apply for funding under multiple components as long as the applicant meets the specific eligibility requirements for each component (see eligibility chart in Section III.A.1). Applicants will be funded in accordance with the funding restrictions listed under Section IV.F.5.In addition, applicants may apply for funding under multiple Initiatives, as long as the applicant applies under the correct NOFA and in accordance with the funding restrictions listed for each NOFA. The application deadline was extended to October 6, 2017 for all applicants. The following is a general description of FHOI (see chart in section III. A. for all eligibility requirements and component listing):Fair Housing Organization Initiative (FHOI). This Initiative provides funding to establish new fair housing enforcement organizations and to support the continued existence of fair housing organizations in building their capacity to enforce the prohibitions on discrimination set forth in the Fair Housing Act.HUD will award grants/cooperative agreements under FHOI for each component. based on eligibility:a. Fair Housing Organization Initiative (FHOI) - (1) Continued Development General Component (CDGC) - $500,000; Applicants may apply for funding under each FHIP NOFA and under multiple Components as long as the applicant meets the specific eligibility requirements for each Component (see eligibility chart in Section III.A.1). A separate application must be submitted for each component. However, applicants will be funded in accordance with the funding restrictions listed under Section IV.F.5.Applicants may also apply for funding under multiple Initiatives, as long as the applicant applies under the correct NOFA and in accordance with the funding restrictions listed in each NOFA. The NIH Research Education Program (R25) supports research education activities in the mission areas of the NIH. The over-arching goal of this NIDDK R25 program is to support educational activities that enhance the diversity of the biomedical, behavioral and clinical research workforce. This R25 program encourages Professional Societies to design and implement educational programs with the goal of recruiting of individuals from underrepresented backgrounds to pursue careers in the biomedical, behavioral, clinical, and social sciences workforce. Applications from Professional Societies supporting the NIDDK mission areas are encouraged to develop educational programs aimed at recruiting talented fellows, and junior faculty from groups underrepresented in biomedical, behavioral, clinical, and social sciences research in the NIDDK mission areas. Professional Societies should propose an educational program based upon an educational experiment which includes a diversity management plan for the Society which should enhance the diversity of the biomedical research workforce, and the pool of individuals from under-represented groups in the organization's programs and leadership. Eligible Applicants Pursuant to section 1417 of the NARETPA of 1977 (99 Stat. 1548; 7 U.S.C. 3152), applications may be submitted by: (1) land-grant institutions, (2) colleges and universities having significant minority enrollments and a demonstrable capacity to carry out the teaching of food and agricultural sciences, and (3) other colleges and universities having a demonstrable capacity to carry out the teaching of food, and agricultural sciences. Research foundations maintained by an eligible college or university are eligible to submit undergraduate and/or D.V.M. training proposals under this RFA. Applicants should be institutions that confer an undergraduate or D.V.M. degree in at least one of the disciplines in the food and agricultural sciences. Students attending two-year colleges that are legally authorized to offer a two-year or equivalent program of college-level studies which are principally creditable toward a baccalaureate degree, may be awarded a MSP Scholarship from eligible baccalaureate institutions in cases where an articulation agreement, bridging agreement, or other type of collaborative arrangement exists between the subject baccalaureate-level institution(s) and the two year college. MSP Scholars from 2-year colleges are expected to transfer and complete their baccalaureate degrees in the partner 4-year institution(s). In such instances, the baccalaureate-level institution must be the applicant. Award recipients may subcontract to organizations not eligible to apply provided such organizations are necessary for the conduct of the project. Failure to meet an eligibility criterion by the application deadline may result in the application being excluded from consideration or, even though an application may be reviewed, will preclude NIFA from making an award. NCIPC is seeking research proposals focused on rigorously evaluating previously or currently implemented federal, state, local, tribal or organizational policies for impacts on multiple forms of violence, including child abuse and neglect, youth violence, intimate partner violence, sexual violence and/or suicide. The proposed research should evaluate the impact of a selected policy on reducing rates of at least two of these violence outcomes. The proposed research must focus on a policy that has not yet been rigorously evaluated. Applicants are encouraged to assess the impact of the policy on as many violence outcomes that is feasible as well as risk and protective factors that are common to multiple forms of violence. The proposed research will add to the limited evidence base regarding the impact of policies on preventing multiple forms of violence by rigorously evaluating federal, state, local, or organizational policy approaches. Enhanced Training And Services To End Abuse In Later Life Program (Abuse in Later Life) provides or enhances training and services to address elder abuse, neglect, and exploitation, including domestic violence, dating violence, sexual assault, or stalking, involving victims who are 50 years of age or older. In FY 2017, OVW will fund projects that will focus on providing training to assist criminal justice and other professionals in recognizing and addressing instances of elder abuse; providing services for older victims of abuse in later life; and supporting multidisciplinary collaborative community responses to victims of abuse in later life.